WASHINGTON (AP) Max Scherzer hopped awkwardly off the mound, putting the Nationals on edge in an otherwise meaningless playoff tuneup. Now Washington is just hoping its ace has his legs back under him by the end of the week. Scherzer was pulled with a right hamstring cramp in his final regular-season start, and NL East champion Washington lost to the Pittsburgh Pirates 4-1 Saturday night. Scherzer was not available to speak with reporters after the game. He left Nationals Park to get a precautionary MRI on the hamstring, according to a team spokesperson. Baker downplayed the severity of the injury, but with six days until Washington opens an NL Division Series at home against the Chicago Cubs, it did not want to take any chances with its NL Cy Young Award contender. ”In a bigger situation, he probably could have stayed in the game,” Baker said. Scherzer, who leads the league in strikeouts and is 16-6 with a 2.51 ERA, stumbled on a 2-2 pitch to Josh Bell in the fourth inning, briefly jumped around the mound and bent over at the waist. Scherzer then began to throw a full-count pitch, but abruptly stopped when time was called. Baker, pitching coach Mike Maddux and team trainers visited the mound and quickly took out Scherzer. Scherzer had given up one hit and struck out five, raising his season total to 268, in 3 1/3 scoreless innings when he was hurt. The Pirates rallied with four runs in the ninth inning off Brandon Kintzler (2-1). 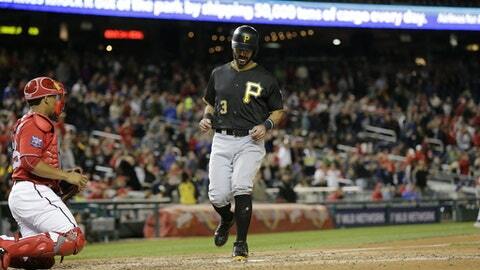 Sean Rodriguez singled home the tying run with Pittsburgh trailing 1-0 and down to its final strike. Max Moroff later hit a bases-loaded triple. George Kontos (1-6) got the win and Felipe Rivero had his 21st save. Zimmerman hit an RBI single in the second off Jameson Taillon, who gave up four hits in seven innings. Scherzer, 33, has now left four of his last 10 starts with various ailments. The two-time Cy Young winner left an Aug. 1 start at Miami with neck spasms. On Aug. 19, Scherzer was scratched from a scheduled start against San Diego and placed on the 10-day disabled list with a recurrence of that neck injury. It was his first stint on the DL since 2009. On Sept. 2, Scherzer took a line drive off his left calf in the first inning of a game at Milwaukee and was pulled after 75 pitches when the muscle tightened at the end of the fifth inning. A day after saying he wouldn’t use Bruce Harper, Baker started the 2015 NL MVP. Harper returned this week from a hyperextended left knee that kept him out more than six weeks. Harper posted his second consecutive 0-for-4 day at the plate. Baker said Harper came through Friday’s game with limited soreness and is getting the outfielder ready for the playoffs. Pirates: CF Andrew McCutchen was scratched just 90 minutes before the game with left foot discomfort after fouling a ball off that foot in Friday’s loss to Washington. McCutchen, in the original lineup batting third, was seen limping badly in the Pirates clubhouse before the game. Nationals: Washington 3B Anthony Rendon asked for a night off and Baker granted it. Rendon told Baker ”he’s a little fatigued” after playing 146 games this season, but plans to play in Sunday’s regular-season finale. … The Nationals reinstated IF Stephen Drew from the 60-day DL and placed RHP Sean Kelley (bone chips, right elbow) on the 60-day DL. Pirates: LHP Steven Brault (1-0, 3.86 ERA) closes the season for Pittsburgh. He has never faced the Nationals. The International League pitcher of the year (10-5, 1.94 ERA, 20 starts) has a 2.81 ERA in his three starts. Nationals: LHP Gio Gonzalez (15-7. 2.68 ERA) gets the final regular-season start for Washington. Gonzalez has a chance to set his career low in ERA, which was 2.89 in 2012, when he finished third in the NL Cy Young Award voting.